Today is Sunday 8/4/2013. 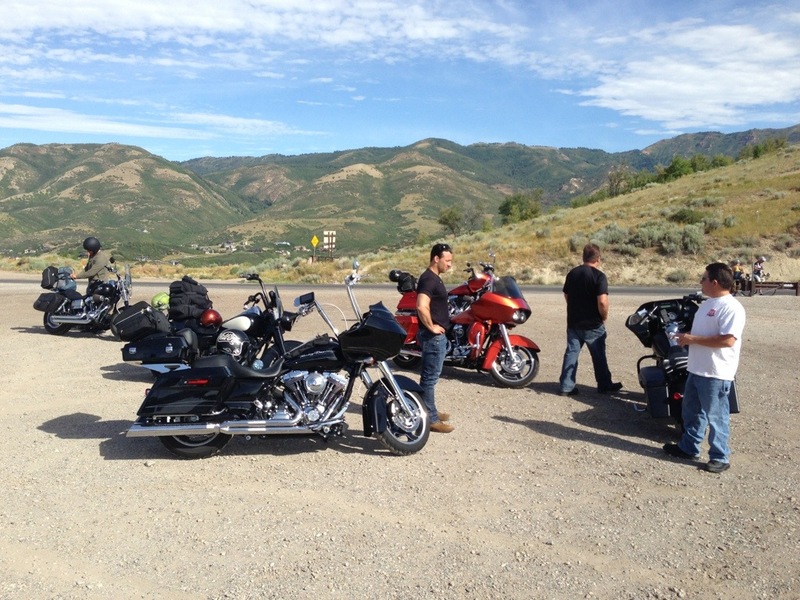 We arrived Salt Lake City last night around 2 AM and had planned on saddling up around 9 AM today for our trip to Red Lodge. 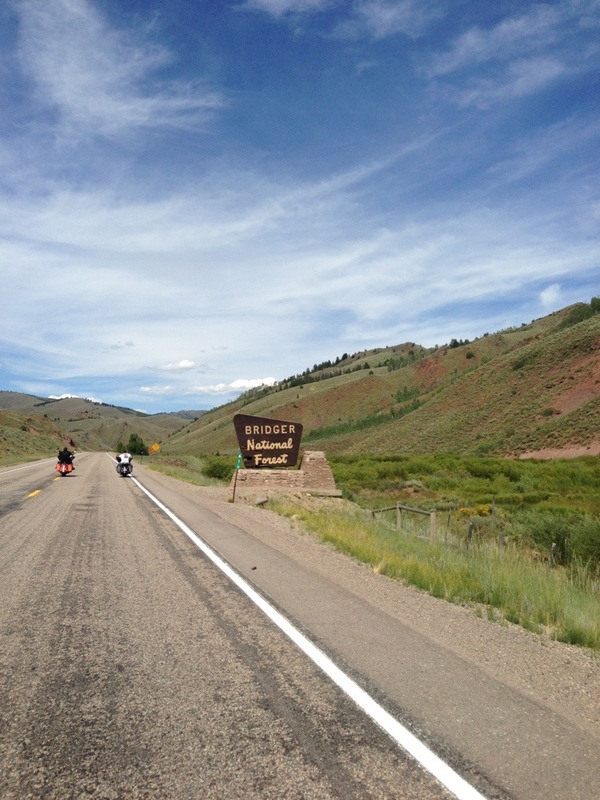 This would be 550 miles including some of the hardest miles on the trip – Yellowstone and Beartooth pass. Two of my friends with whom I had rode last year met us at 9 AM for our ride. 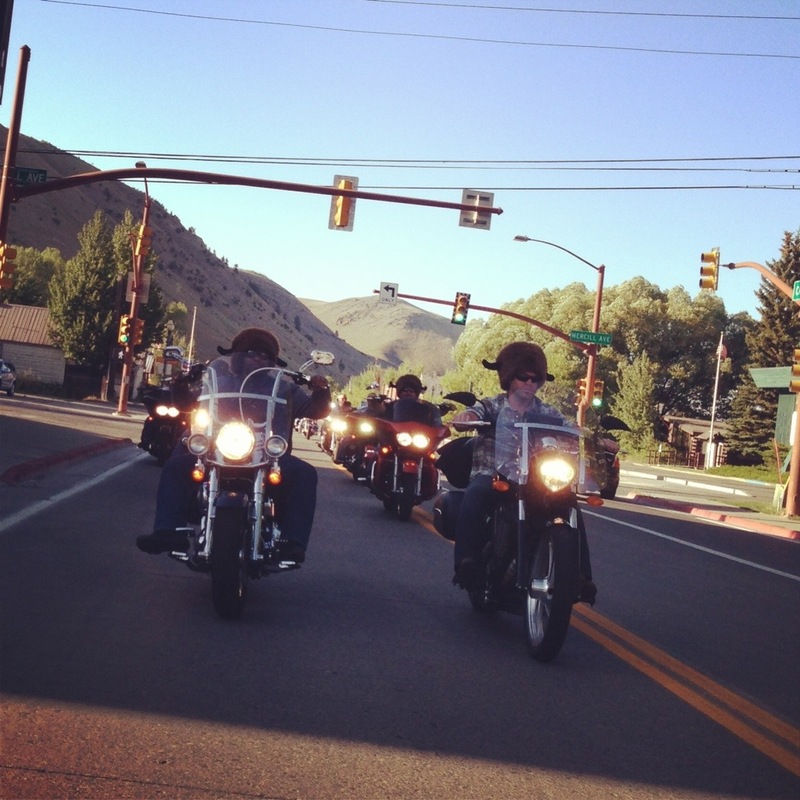 Salt Lake City natives Bert and Jamie pulled up on their orange and black road glides and greeted the group. We would put our paths in their hands today as they knew the roads to Jackson better than I. From the moment they pulled up, we knew it was going to be a fast, white knuckled ride. 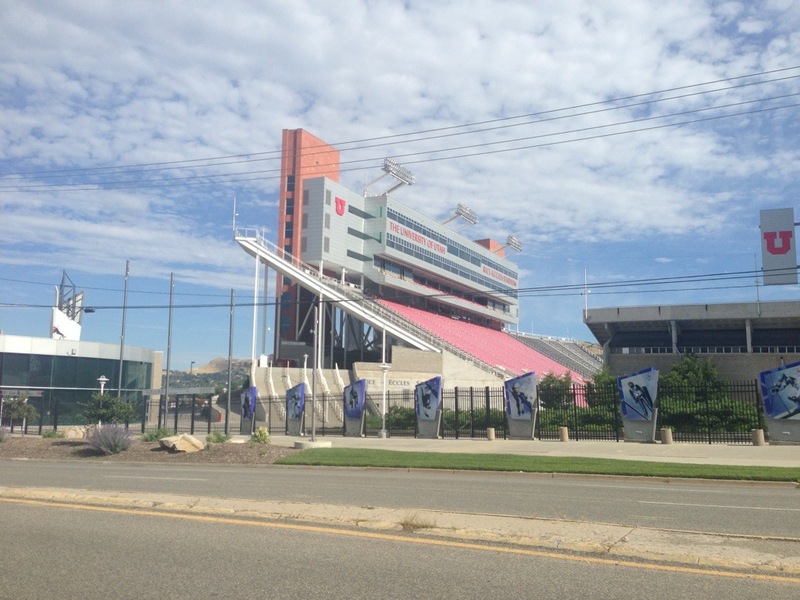 First we rode the University of Utah on the way to Evanston. 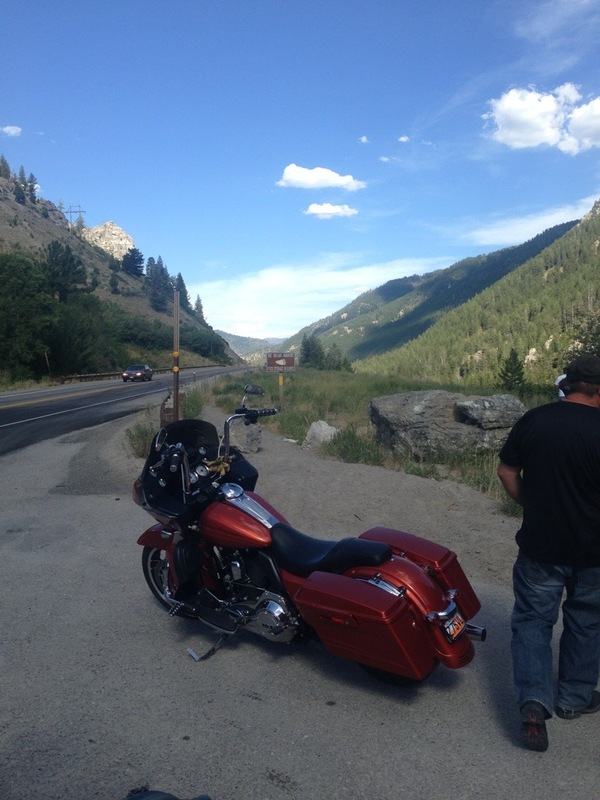 We were heading to Emigrant Canyon for some twisty’s on the way to Kelly’s biker bar just past Morgan Utah. After a brief photo-stop we were carving canyon roads and dodging cyclists. This route was scenic and slightly technical. The loose gravel definitely added to the challenge but made the ride that much more exhilarating. We stopped at Kelly’s bar to find that it was closed. As Jimmy dismounted his bike, the side stand gave and the bike fell over onto his engine guard. I should mention that Jimmy is our most experienced rider and best tech so seeing this fall was a surprise to all of us. Luckily it wasn’t even scratched so we could enjoy the morning. Kelly’s was closed but we were able to convince a waitress standing outside that opening for a beer would be the right thing to do. Personally I don’t drink and ride but one beer would be safe. 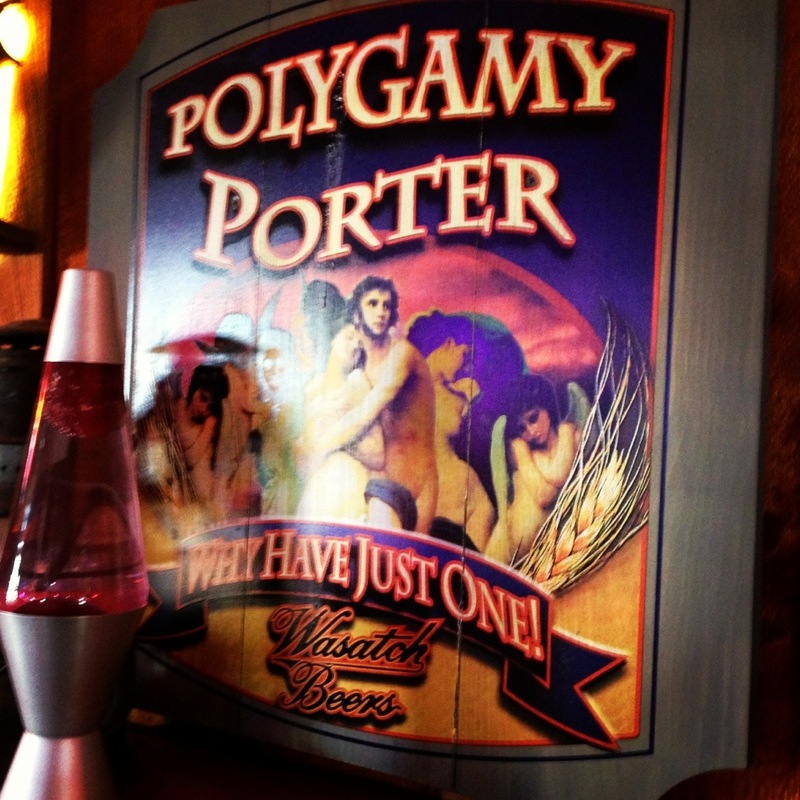 I opted to try a Utah original – Polygamist Porter. As the sign stated, you can’t have just one (a joke related to Mormons having multiple wives – don’t get pissed at me, I just write this stuff and didn’t name the beer). 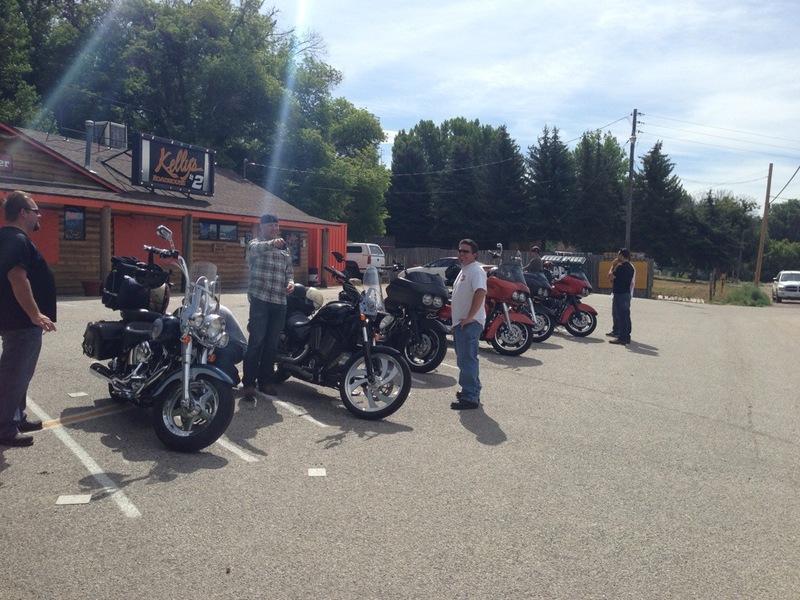 Funny thing that happens with a closed biker bar is that when you park 8 bikes out front, others think it’s open. Within 20 minutes where were 4 dozen bikes parked out front and they had no choice but to open for business. Food at Kelly’s: Have the peanut butter burger. It sounds terrible but is really something special. 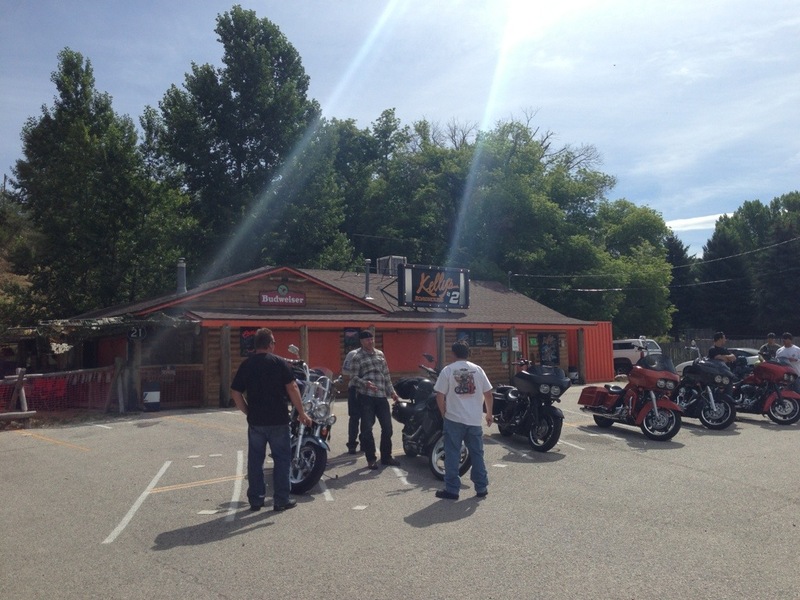 While we waited for our food, we heard news of a biker crashing in front of the bar. Apparently he was conscious but would need medical attention immediately. I hate these stories and especially hate hearing about it two days in a row. Such an update reinforces my decision to wear a DOT helmet. The ambulance arrived and he fought the EMTs. The rest of our ride was, in one word, fast. We were between 90 and 105 MPH for the entire ride, burning gas like it was our job. Bert and Jamie could ride – I loved it! After our first fill-up, a few of us needed a bio break. We stopped and watered the side of a gas station as the lines for the restrooms were too long for us to wait. With the exception of Jimmy, we all topped off. It had only been 70 miles since our last stop so with a 6 gallon tank he was either confident he wouldn’t need to fill or simply forgot. Either case, back on the road. Back up to 100 miles an hour and now the heat was 100 degrees. The wind coming off the open ranges was brutal. Cross winds be damned, these were spinning winds. This is how tornados are made. We would come down a hill at break-neck speeds and get tossed by a swirling wind moving us from our side of road to the other. We were constantly losing riding partners who had problems keeping up and at one point there were three groups. Bert, Jamie, Jimmy and me at the front. Andrew in the middle and the others a few miles back. Safety first – go at your own speed – no problem taking a few extra minutes and avoiding blowing a motor or worse. Now it’s just Bert, Jamie and me at the front. Where’s Jimmy? I signaled that I’d wait for him. I’ve been riding with Jimmy for 20 years and he is the only guy who rides faster and more aggressive in open spaces than me. If he fell back that means he is either checking on the other riders or something is wrong with him. Everybody passed me, except for Jimmy. I slow to 30 MPH and wait. Finally he comes putting down the hill at 60 MPH and points to his tank. His gas was low. I told him that the GPS showed 25 miles to the next station. He said that he was on fumes and wouldn’t make it. I stayed on his left and rode until his bike had breathed it’s last breath. 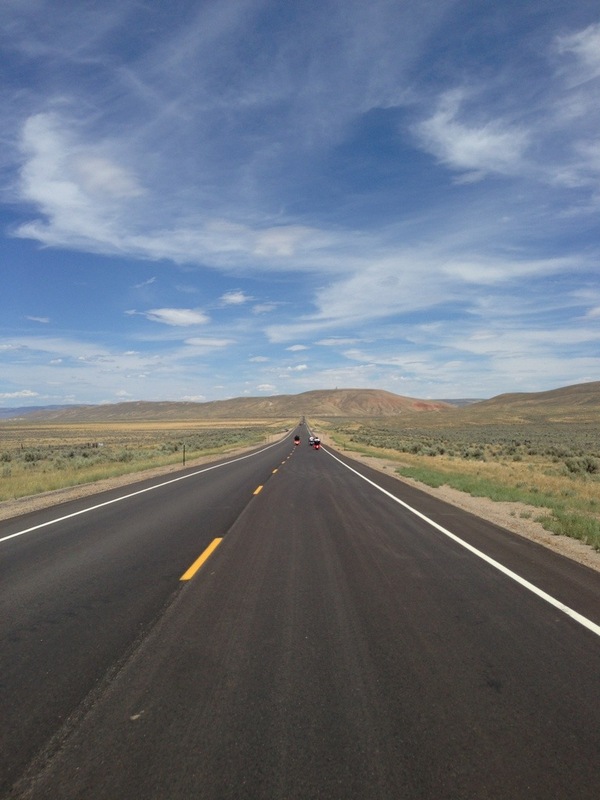 The heat and high speeds cut our fuel efficiency down to 2/3 of normal riding conditions. Lesson learned. 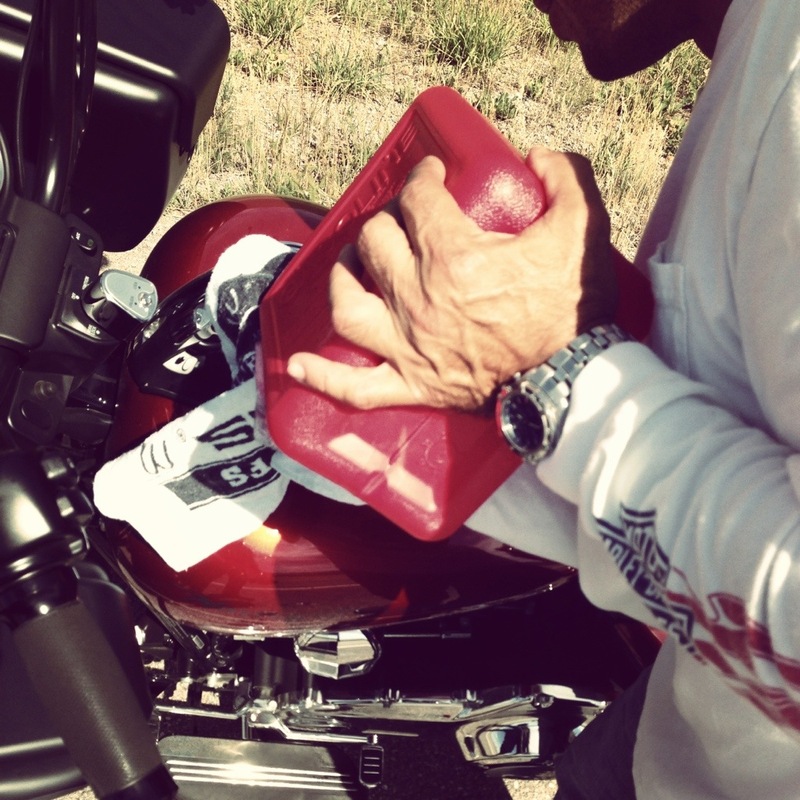 I rode up for 5 miles where our crew was camped out at a small fill station and grabbed the gas can that Tiki thought to pack. It was leaking all over the place including on my jeans but would be enough to get Jimmy to the station. Sadly, nobody stopped for him while he was roadside. Not even another biker or dude with a trailer. 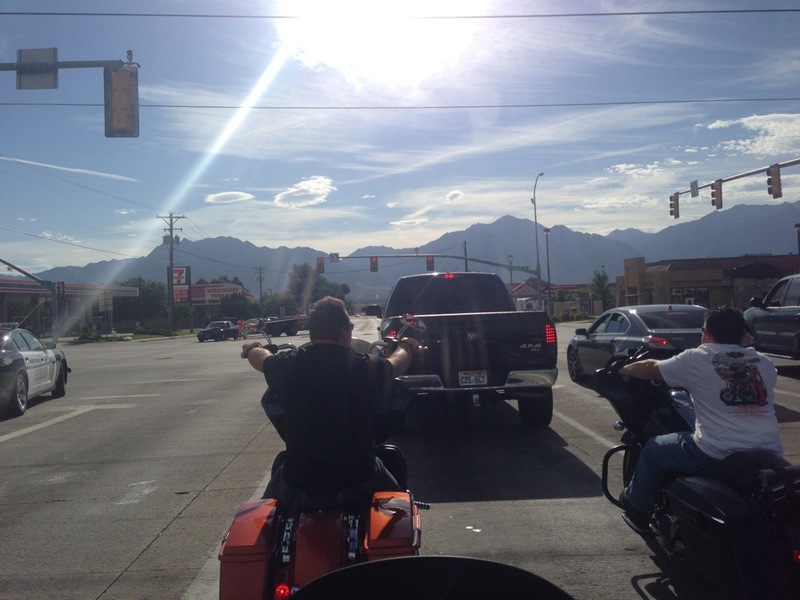 You know that douchebag with a trailer is going to Sturgis to pretend he rode there. I hate that guy even more now. People – If somebody is stuck, in the middle of nowhere, alone, on the side of the road and you don’t stop – you just don’t get this whole biker community thing. If you are this guy, please don’t wear our shirts, don’t read our site and don’t call me brother – you are not one of us. Rant over. Un-phased, Jimmy filled up and was back on the road. Again, the most experienced rider and best bike builder and tech I know and this happened. It goes to show that no matter how experienced you are, stuff happens on these trips. Adapt and move on. It was becoming abundantly clear that we wouldn’t make it to Red Lodge tonight. The final 250 planned miles were winding roads through wild animal territory without any chance for help should we get stuck. We would have to stay in Jackson but I didn’t have the heart to tell the guys this yet. Finally we pull over for a photo opportunity 50 miles from Jackson and I take the vote of pushing on or getting after it in Jackson. There was some debate but we decided to enjoy the night in Jackson and make up for the miles the next day. This seemed like the smart decision especially when we rode immediately to the Million Dollar Cowboy bar and sucked down a few beers before checking into our hotel. 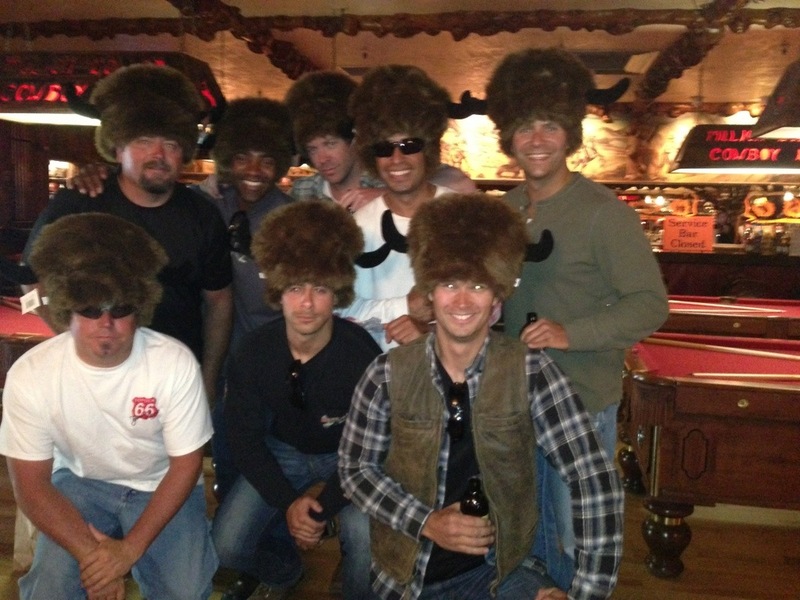 I remember a store next to the Cowboy bar that sold Buffalo hats. 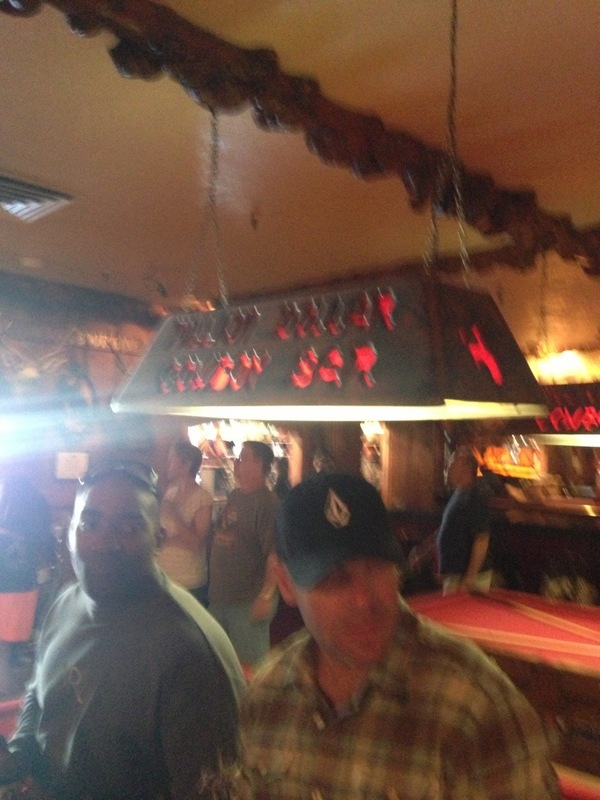 Ray and I snuck out of the bar and bought a hat for everybody in the crew. We would drink like Bison tonight! But before we do, we would generate some laughs for the good people of Jackson. Later that night, we would have a good meal at the “local” restraurant. 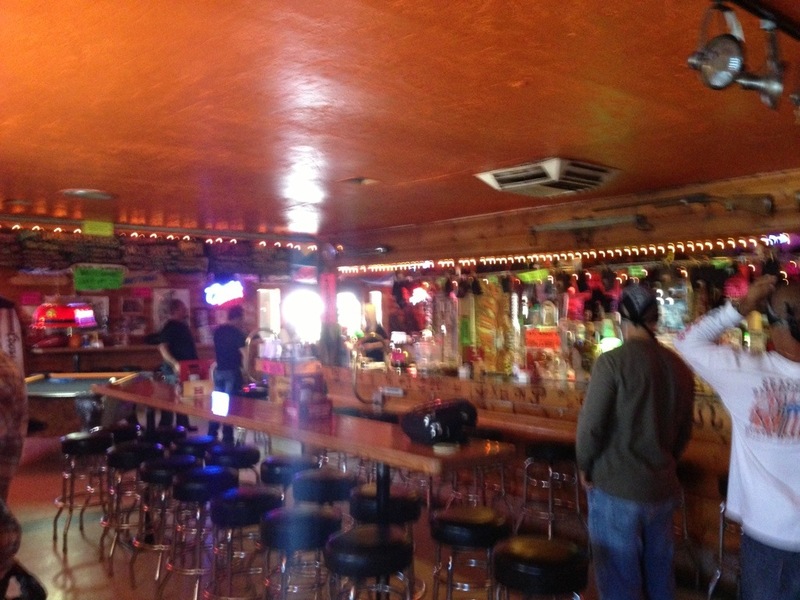 We wouldn’t ride deep into the night and we would enjoy ourselves via Jack Daniels at the best bar in Jackson. Even better, Bert and Jamie stuck around so the 8 of us ended up having a great old time before we had to turn in. 6 AM Saddle time tomorrow and we could use at least 3 hours of sleep.